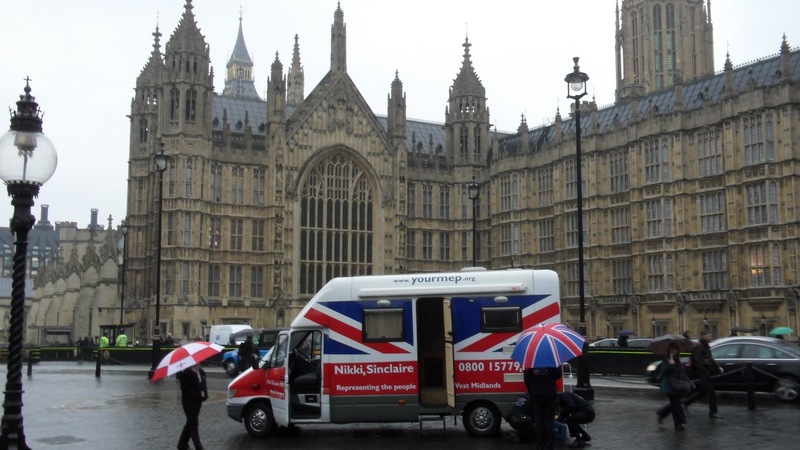 Referendum on Leaving The EU to Go Ahead! The details prove int5eresting and the cause well worth supporting! I presume John Blackwell is financially behind the concept of holding Referendums independently. 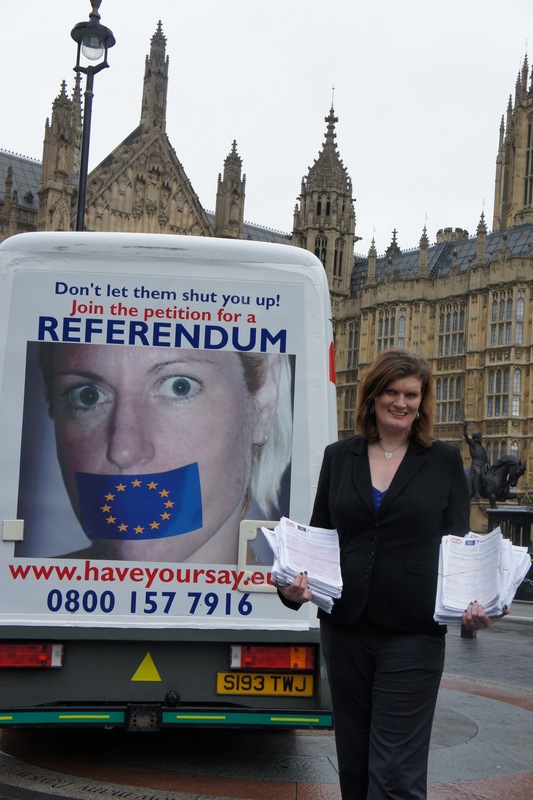 This idea put forward by Nikki Sinclaire MEP West Midlands, who obtained the signatures needed to obtain a debate on A Referendum in The House of Commons that did so well. 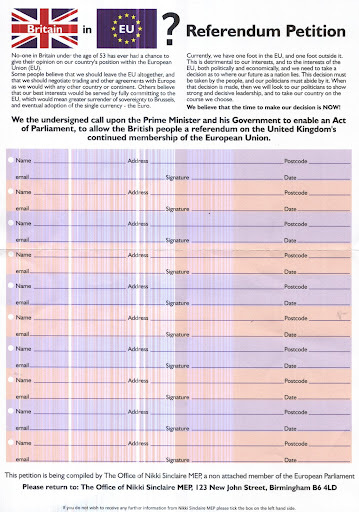 Having raised the profile with her Petition for a debate on A Referendum the result was the largest vote against the Government, in fact in The HoC, ever on the issue of their betrayal of these United Kingdoms and self serving surrender of our Independence, Sovereignty and rule by a foreign and alien power EVER. The petition is not expected to do well without publicity but that will continue apace in the early spring, I understand. 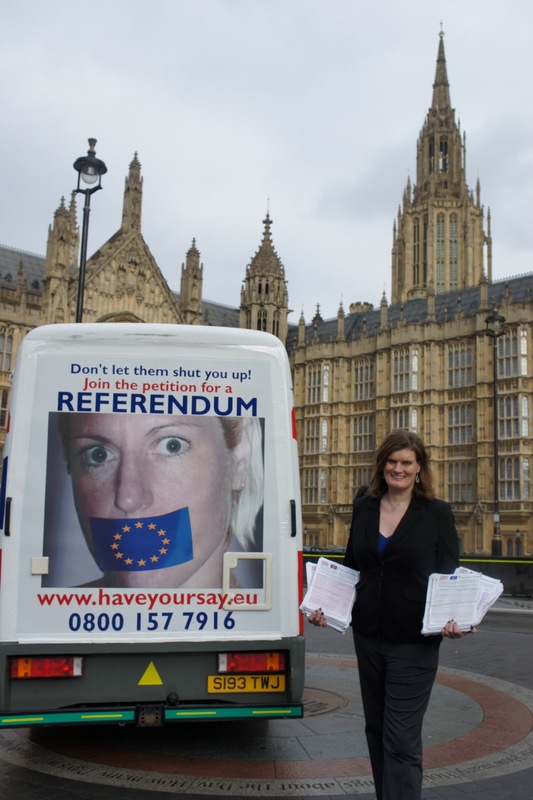 Funding will I gather be primarily by Nikki Sinclaire and it is hoped that Trevor Coleman MEP and Mike Nattrass MEP who have removed themselves from the vile extremist EFD Group in the EU with whom some of the less ethical UKIP MEPs are associated. Let us hope Mike Nattrass & Trevor Coleman will act honourably and support the financing for the advertising vehicles, magazines and staffing around the UK for this petition to yet again reach the 100,000 goal by the end of the summer recess or before. has gone out to 80 > 100,000 people in the last week or so – I gather Nikki Sinclaire has funded it, together with its postal distribution, and Trevor Coleman & Mikle Nattrass have promised to reimburse her – though I understand that Trevor Coleman is also seeking to repeat an earlier failure with the production of a DVD, which you may remember he did in the past with his chum Ashley Mote but DVDs are very much yesterday’s idea and have little impact! The idea of holding A Referendum privately in various constituencies was always part of the plan but I gather John Blackwell has opted to take up the idea early and has John Gaunt fronting it for him. I believe Sinclaire’s plan was more politically astute and professional but let us hope John Gaunt can pull it off and I’m sure Sinclaire’s petition will help them. I expect the sock puppets and ner do wells of EUkip leadership claque will be out in force poo pooing the idea – never having had one of their own beyond self enrichment and self aggrandisement it would seem, to judge by their lack luster track record of corruption, abuse, whoring, theft, betrayal, drunkenness, squabbling, racism and fraud! I am sure that any help you can give will be welcome and any effort to raise the profile in these United Kingdoms is infinitely more valuable than all the posturing in the world in The EU pretend parliament with its sound bite stances and childish rants, which all amount to utter irrelevance, due to the total absence of meaningful democracy in The EU’s core structure. 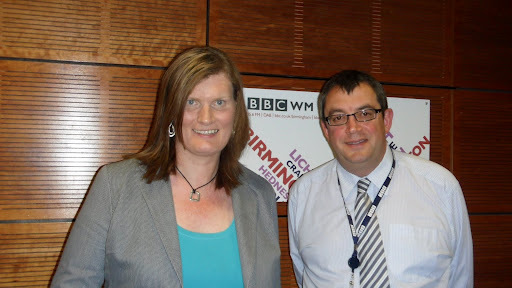 #0540* – More on Nikki Sinclaire MEP’s busy week since UKIP’s Apology! 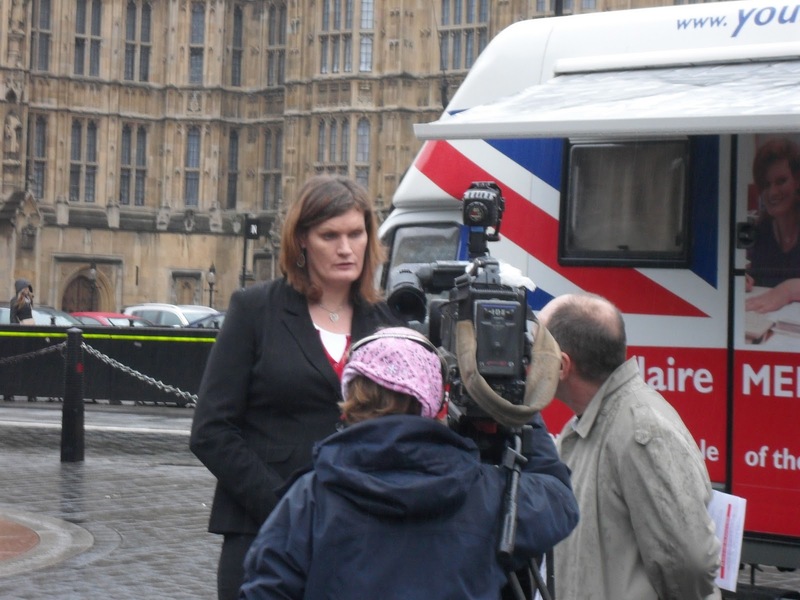 More on Nikki Sinclaire MEP’s busy week since UKIP’s Apology! 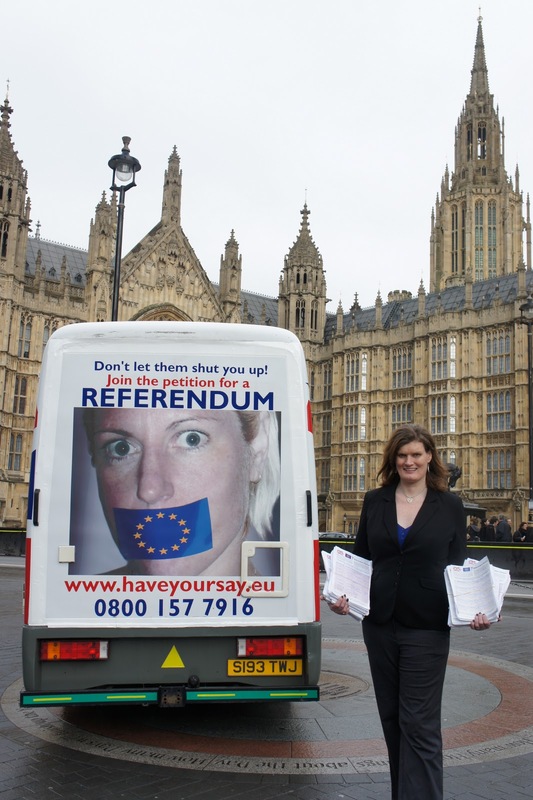 Freed from the lies and abuse by UKIP Leadership Sinclaire can now get on with her duty to campaign to Leave-The-EU! 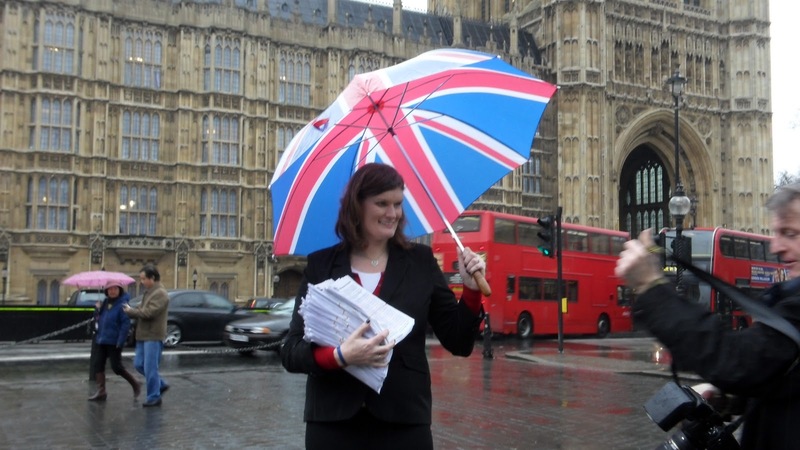 here are the updates on Nikki Sinclaire’s week now that she has received the apology from UKIP for their abuse and harassment of her see CLICK HERE she can return to her duties working to Leave-The-EU. I gather the week still hasn’t ended and she was hoping to drop in to encourage her constituents in Meridan who are well into the 2nd. year of protest against inappropriate Green Belt Developement by so called Travellers including the Millionaire Jensen owning fashion concious claimed Gypsy! Looks like more junk food & takeaway on route home to inflame the Gall Bladder again! Then I gather there is at least one article in a major Sunday paper as well – so I gather from a media contact of mine and MAYBE an even more significant one regarding Derek Clark MEP! Keep an eye on this blog and on my Twitter for updates. 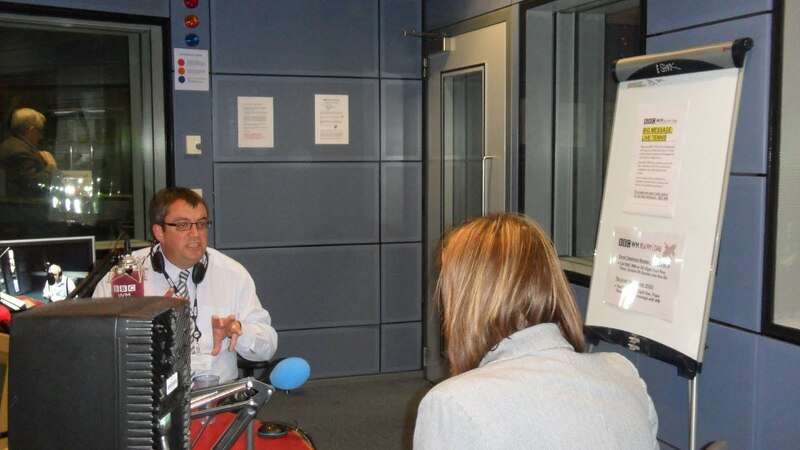 After the interview I was pleased to visit a successful local small business that specialised in direct marketing. Their production and professionalism is outstanding. At 4.45 I was back at the office to catch up on a weeks worth of paperwork. I’m not expecting to get home much before 9pm! 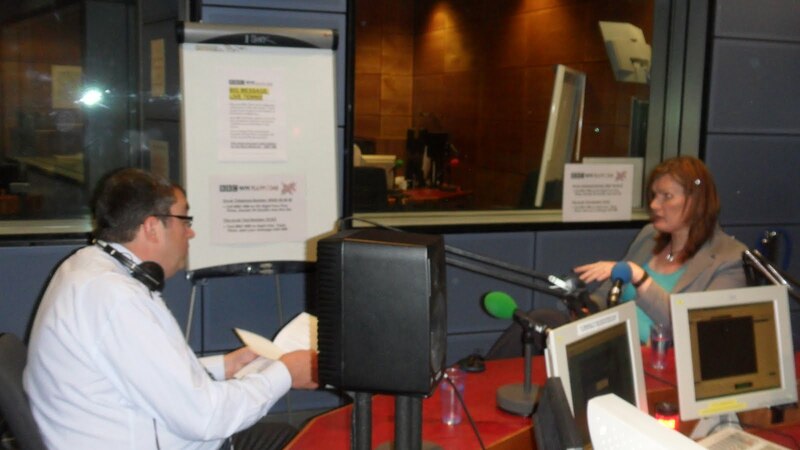 I had to leave Shrewsbury to travel back to Birmingham to be interviewed for the BBC Radio‘s Hardtalk programme presented by Steve Dyson (pictured above). It was a good interview, with many hard hitting questions. It should be broadcast sometime in the next month or so. 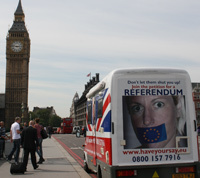 SIR – Could I alert your readers to the campaign for a referendum on our membership of the European Union (haveyoursay.eu)? Britain is currently half in the EU and half out, and whatever your viewpoint, that is no good for ourselves or the rest of Europe. Some people think Britain should come out altogether and go back to making our own laws and trading with whosoever we wish – being out of Europe doesn’t mean we couldn’t trade with them. Other people think Britain should go further, transferring government from Westminster to Brussels and abandoning the pound in favour of the euro. Either way, those of us in favour of a referendum think it is something the people should be allowed to decide. It is, after all, a far more important subject than “alternative voting” that was put to the public earlier this month. The English people are trusting, tolerant and generous, but history has shown that when we are pushed too far, we fight back. I would urge anyone – for or against the EU – who thinks we should be allowed a say on our membership to sign the petition. 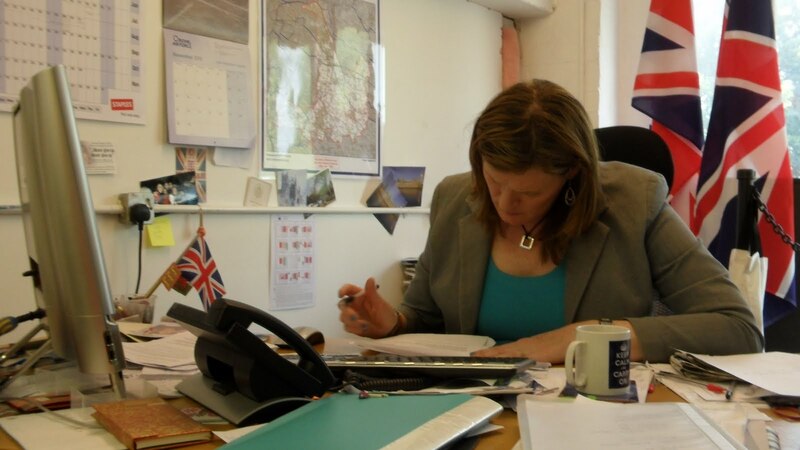 You can contact the campaign office on 0800 157 7916 or at eureferendum@ gmail.com. Nikki SINCLAIRE & Mike NATTRASS @ EDP MEETING for The PETITION! & A STRANGE STORY OF BETRAYAL of UKIP by THEIR LEADERSHIP!! The Keynote Guests at The English Democrats’ AGM were on The Saturday John Gaunt of radio celeb status, an avowed and OUT EUrosceptic and James Pryor and Bridget Rowe were there to meet and greet old friends and new in promoting their EU Referendum Campaign – complimentary, as you can see if you CLICK HERE to the Key Note speakers on The Sunday who were Nikki Sinclaire & Mike Nattrass promoting THE Petition Campaign for A Referendum. I along with fellow West Midlands MEP, Mike Nattrass was pleased to have the opportunity to speak at the English Democrat AGM in Nottingham today having had a very successful business breakfast meeting with their leadership team. 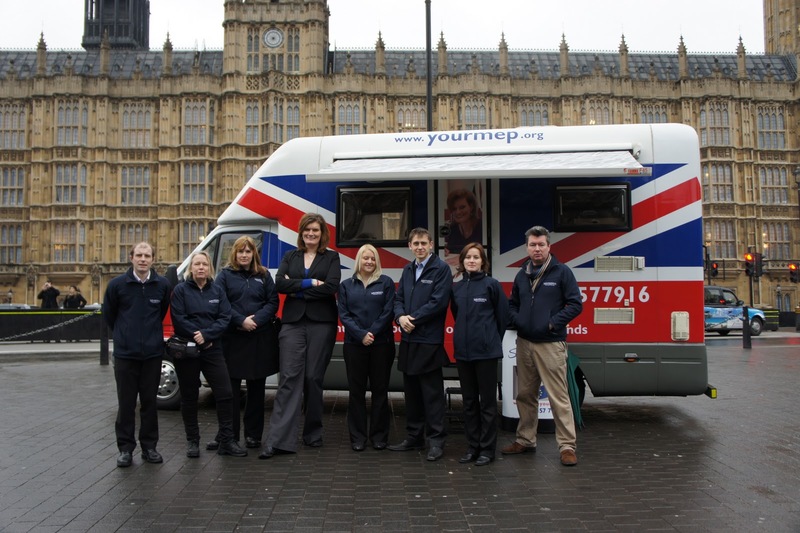 We spoke individually and then took questions about the European Union, being an MEP, and the Campaign for a Referendum. It was an enjoyable and interesting experience exchanging views and developing an understanding of each other’s perspective. It is these cross party initiative that are so important if we are going to win the day. Ps. I was quite surprised to learn during our breakfast meeting the overtures made by Malcolm Pearson towards an electoral pact during the general election. Constituencies where UKIP would not stand were agreed however, as with so much else Pearson undertakes, he reneged on this undertaking costing UKIP considerable support in the areas that they had agreed. This sort of duplicitous behaviour for which Farage’s ‘team’ have a consistent track record does little to enhance UKIP’s credibility – it is akin to being childishly rude to people in the EU Parliament – it looses serious supporters but gains some riff raff. 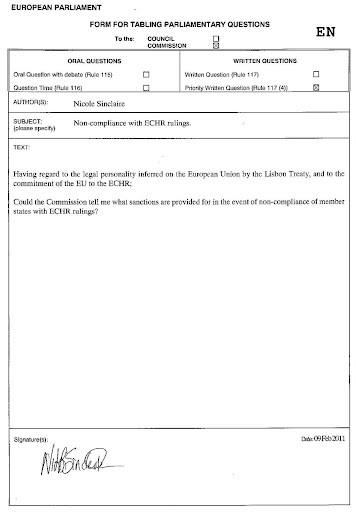 I gather there were attempts made not only to do an electoral deal with The EPP where UKIP would not stand against them in selected seats but since Paul Judge’s Party The Jury Team was working with The EPP I presume they met with The Jury Team as well. I am well aware that Pearson met with various members of UKFirstParty to try to persuade them to come back to UKIP but all declined except eventually Martin Hasslam who, against the advice of his honest associates in UKFirstParty, sent in his application to rejoin – yet again UKIP Leadership reneged on their undertakings and their own initiative and suggestion and refused him permission to rejoin. UKIP are so untrustworthy it is staggering – hardly any surprise that Tim Congdon who is foolishly wasting his time standing as a candidate in the leadership said ‘sadly there is more talent amongst the ex UKIP members than has remained in UKIP’. A measure of how little UKIP is trusted can be seen in The General Election results where although the majority of the British peoples wish to leave The EU and a huge majority want to see it de-politicised. This is the very group which Nikki & Mike are working with to get The Petition for The Campaign for an EU Referendum signed – already they are upto 20,000 signatures whilst James Pryor aided by Bridget Rowe are pushing forward with the EU Referendum Campaign aimed at bringing direct pressure on politicians and corporate bodies signing up Union Bosses whilst the people SIGN THE PETITION. You will note however that despite a majority of the electorate wanting OUT UKIP are only trusted by 3.1% of the electorate to deliver! After 17 Years that is the best UKIP can do and all because no one trusts their leadership – the message is popular, the members still try but again and again they are let down by their leadership team! Betrayed, lied to, robbed, cheated, conned and debased whether by MEPs copulating in the streets of Belgium, defrauding the tax payers, behaving like children in The Parliament, having temper tantrums, sending childish obscene Twitters, urinating in flower pots in hotels, defaulting on debts, outright lies, plotting AGAINST the members – Rationally one is surprised they do so well! !